The object of iCell is to solve a series of different types of puzzles by moving your cell that resembles a sperm cell. The first objective is to get it food, then to fertilize an egg, then to protect the zygote from predators. The next level is to avoid sliding bars. 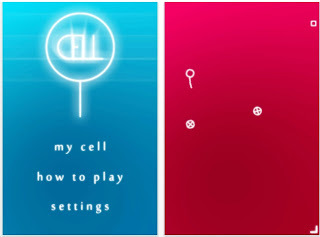 The tricky thing is to manipulate the cell. That's a bit tricky. This game/puzzle is very weird. Perfect for somebody in a mental ward.